Incidentally, I was contacted by Frank D’Angelo through a Facebook site I admin, he talked to me about his musical project entitled Materium, which belongs to the progressive rock/metal realm, so I got interested on it, and he kindly introduced me to their music. This is a US based band with experimented musicians who have been involved in several projects in their lives, and since 2012 (if I am not wrong) they gave birth to Materium, a new promising band whose debut album “In the Materium” was released earlier this year. It contains 9 tracks and a total time of 51 minutes of very good music. The album opens with “In the Materium” which is a really strong opener, actually, it might be my favorite song here. I love the whole track, the vocals, the guitars, drums and bass, the structure is pretty good because one can enjoy the mood changes, going from an explosive beginning and then the music flows and offers some rhythm changes, though the energy and emotion never disappears. It is a very well crafted song, a great introduction to the band’s music. “Zombie Bath Salts” continues with the great sound, though this song is different, here keyboards are included, adding that special touch that puts it on the progressive metal map, but well, labeling might be pretentious when all that really matters is the music, however, you can have an idea of the music when labeling. This is a cool instrumental track, so sit down, close the eyes, shake your head and enjoy. With “Man of Tomorrow” I have an issue, because it always reminds me of some grunge bands, I am sure Materium did not intend to sound like them, but I couldn’t help but remembering those 90s acts due to the voice, and in moments to the music. “Moon over Li Jiang” has a softer sound, here I love the bass lines I think they stand out a bit, the music overall might be catchy as the rhythm and lyrics are easy to sing, but who cares if its catchy or not when you enjoy it. There is also a pretty nice guitar solo after the third minute, cool. “I’m not your Enemy” has an addictive sound since the first seconds, the drums are part of it in a main role, and then little by little vocals and the other instruments join. The music flows and reaches a climax when the chorus appears, and in this moment, the sound reminds me of some 00’s nu-metal bands (no offense intended, of course); the second part is darker and heavier, very good. “Nobody thinks of you (anymore)” has a somber beginning, but it only lasts for a few seconds, later vocals and the other instruments join in a soft way and together begin to build up the structure, adding different nuances to the musical passages. The song is nice, but not my favorite definitely. “Prevail or Fall” is pretty interesting, it is impossible not to sing “I can be your superhero” haha, I do it and actually I love singing it. The structure is very well done, I like a lot the work of guitars and bass here, they bring the necessary textures and produce diverse atmospheres at the same time. After 1:30 a heavier Materium appears for some seconds, but later the music returns to its original form. Great track! The progressive rock returns with “It could be Doomsday”, here the reminiscences of Rush are present at least in the first introductory passage, because a minute later the music changes and becomes heavier, but more interesting as well. Let me tell you that this is an instrumental track, which shows the musician’s skills in composition and performance. The music is very rich, it has cool time changes and wonderful guitar and keyboard riffs; the sense of power and energy is inherent here, but more important, the music has a direction, it was greatly composed and successes with the listener, at least it happened with me. Excellent! And the album finishes with “Out there somewhere” which happens to be the longest track here. The massive offering of colors, textures and nuances this single song has is excellent, it is enough to close one’s eyes and let the music do the rest, it led me to create images in my mind and even provoked some curious reactions in my face, there was a moment where I felt powerful and wanted to leave what I was doing just in order to shake my head. The bass sound here is great, and the drums are always constant and cool, so after all Materium is a band whose members are essential because every one of them adds the necessary grains of sand. 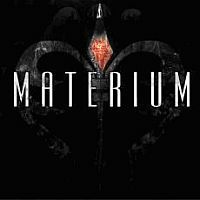 I like Materium’s debut, it is a very good album with music that can be well received by those who like metal, heavy rock, and prog rock (prog metal, actually), and though it is not what I would call masterpiece, I believe it is solid and the band has to be proud of it. My final grade will be 8 out of 10.